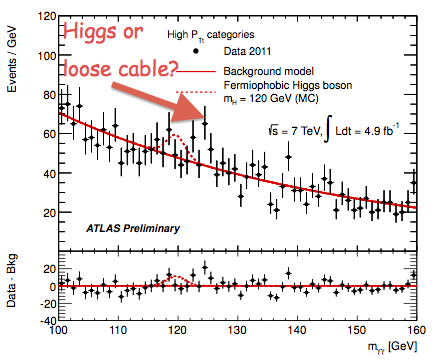 RÉSONAANCES: April Fools '12: Higgs or loose cable?! What amateurs!!! All these people should be fired!!! Nice April Fool. Almost got me. I'm going to wait for confirmation of this story from other sources on a date other an April 1st. As long as it doesn't call the new gluino evidence into question. Well .... are you serious? I heard that the origin of the loose cable was in the Resonaances' brain and due to cultural information he has stored through his interaction with his social environment through the years. Shortcut is a 1-rst April joke, of course. However you must know that self-action in Theoretical Physics is like connecting an amplifier outlet to its inlet with a positive feedback. Such a theoretical construction generates funny mass corrections removed later by hand (renormalizations). The corresponding substantiation (known as "bare particle physics") has nothing to do with reality and it is not a joke. Well done! I like this post. Should have re-run "BEH Boson" post also. I'm unsure of the first inaccuracy you list: OPERA *is* a CERN experiment, classified as CNGS1 in the SPS programme. Yep, I should have been more precise. 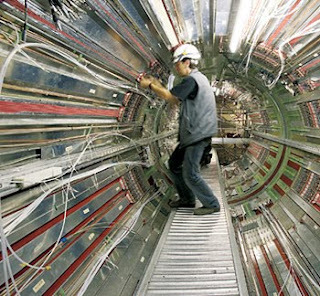 Of course, CERN is involved as it provides the beam (and a lot of money has gone down the drain too...) But the experimental collaboration that performed the data analysis is independent of CERN, unlike that of ATLAS, CMS, ALPHA, CAST, etc. It is a CERN experiments when there are hints of a new scientific result, when there is a world wide webinar to run in the main auditorium. It is not a CERN experiment when the results disappear.